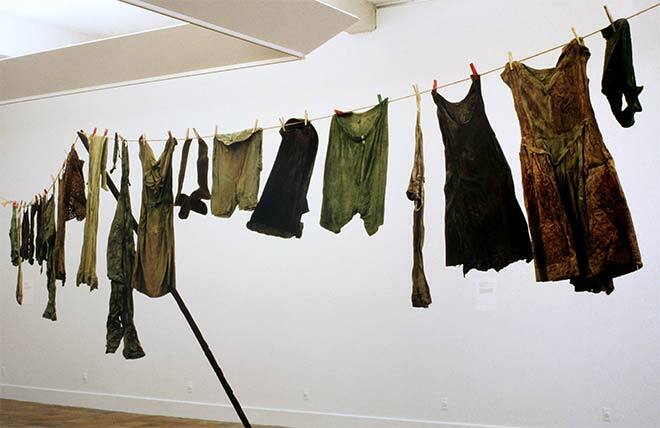 When the Govett-Brewster Art Gallery in New Plymouth purchased Christine Hellyar's 'Country clothesline' (1976) there was an outcry. Consisting of 22 pieces of clothing dipped in rubber latex, hung from a primitive clothesline of flax rope with a wooden prop, the work had a feminist dimension, suggesting the reality of women's lives. In addition to its political undertones, it represented a departure from conventional sculpture and sculptural materials. Hellyar was interested in collecting and interpreting everyday and natural objects, and the life cycle and conservation were themes she developed in later works.